Create artwork on your own TV. Plugs directly into your television and lets you draw, paint, create slide shows and games, add special effects, sounds, and even animation. Use your imagination with this plug and play Creativity System. A complete creation station. 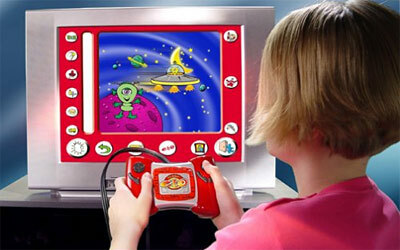 Offers creativity oriented play - all contained in a single handheld controller unit. You can create original artwork, access a library of stock images, backgrounds, load fun and colorful clip art images, animate and add music to your drawings.